To the uninitiated, a modern-day mikvah looks like a miniature swimming pool. In a religion rich with detail, beauty, and ornamentation — against the backdrop of the ancient Temple or even modern-day synagogues — the mikvah is surprisingly nondescript, a humble structure. Its ordinary appearance, however, belies its primary place in Jewish life and law. The mikvah offers the individual, the community, and the nation of Israel the remarkable gift of purity and holiness. No other religious establishment, structure, or rite can affect the Jew in this The world's natural bodies of water — its oceans, rivers, wells, and spring-fed lakes — are mikvahs in their most primal form way and, indeed, on such an essential level. Its extraordinary power, however, is contingent on its construction in accordance with the numerous and complex specifications as outlined in Halachah, Jewish Law. The world's natural bodies of water — its oceans, rivers, wells, and spring-fed lakes — are mikvahs in their most primal form. They contain waters of divine source and thus, tradition teaches, the power to purify. Created even before the earth took shape, these bodies of water offer a quintessential route to consecration. But they pose difficulties as well. These waters may be inaccessible or dangerous, not to mention the problems of inclement weather and lack of privacy. Jewish life therefore necessitates the construction of mikvahs ("pools"), and indeed this has been done by Jews in every age and circumstance. Briefly: A mikvah must be built into the ground or built as an essential part of a building. Portable receptacles, such as bathtubs, whirlpools, or Jacuzzis, can therefore never function as mikvahs. The mikvah must contain a minimum of two hundred gallons of rainwater that was gathered and siphoned into the mikvah pool in accordance with a highly specific set of regulations. In extreme cases where the acquisition of rainwater is impossible, ice or snow originating from a natural source may be used to fill the mikvah. As with the rainwater, an intricate set of laws surrounds its transport and handling. Today it is not just a Jewish metropolis that can boast a mikvah. In remote, even exotic, locations- Anchorage, Alaska, and Bogota, Colombia; Yerres, France, and Ladispoli, Italy; Agadir, Morocco, and Asuncion in Paraguay; Lima, Peru, and Cape Town, South Africa; Bangkok, Thailand, and Zarzis, Tunisia; and almost every city in the C.I.S. (former Soviet Union) — there are kosher and comfortable mikvahs and rabbis and rebbetzins willing and able to assist any woman in their use. In many communities a tour of the mikvah is available on request. Upon arrival in a new city or when traveling, information about mikvahs in the region can be obtained by phoning the local mikvah office, the Orthodox synagogue, or the Chabad House. Immersion in the mikvah has offered a gateway to purity ever since the creation of man. The Midrash relates that after being banished from Eden, Adam sat in a river that flowed from the garden. This was an integral part of his teshuvah (repentance) process, of his attempt at return to his original perfection. In Temple times, the priests as well as each Jew who wished entry into the House of G‑d had first to immerse in a mikvah. On Yom Kippur, the holiest of all days, the High Priest was allowed entrance into the Holy of Holies, the innermost chamber of the Temple, into which no other mortal could enter. This was the zenith of a day that involved an ascending order of services, each of which was preceded by immersion in the mikvah. The primary uses of mikvah today are delineated in Jewish Law and date back to the dawn of Jewish history. They cover many elements of Jewish life. 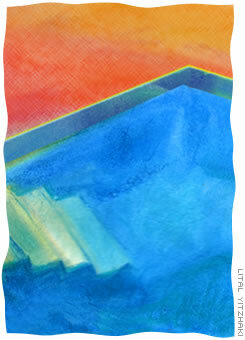 Mikvah is an integral part of conversion to Judaism. Mikvah is used, though less widely known, for the immersion of new pots, dishes, and utensils before they are used by a Jew. The mikvah concept is also the focal point of the taharah, the purification rite of a Jew before the person is laid to rest and the soul ascends on high. The manual pouring of water in a highly specific manner over the entire body of the deceased serves this purpose. Immersion in the mikvah is the culmination of the Taharat Hamishpachah discipline. It is a special moment for the woman who has adhered to the many nuances of the mitzvah and has anticipated this night. Sometimes, however, the woman may be feeling rushed or anxious for reasons related or unrelated to this rite. At this point, she should relax, spend a few moments contemplating the importance of the immersion, and in an unhurried fashion, lower herself into the mikvah waters. After immersing once, while standing in the waters of the mikvah, the woman recites the blessing for ritual purification and then, in accordance with widespread custom, immerses twice more. Many women use this auspicious time for personal prayer and communication with G‑d. After immersion, woman and husband may resume marital relations. Yet the observance of Family Purity is a biblical injunction of the highest order. The infraction of this law is equated with major transgressions such as eating chametz (leavened foods) on Passover, intentional violation of the fast on the holy day of Yom Kippur, and not entering into the covenant through ritual circumcision, brit milah. Most Jews see the synagogue as the central institution in Jewish life, But Jewish Law states that constructing a mikvah takes precedence even over building a house of worship. Both a synagogue and a Torah Scroll, Judaism's most venerated treasure, may be sold to raise funds for the building of a mikvah. In fact, in the eyes of Jewish law, a group of Jewish families living together do not attain the status of a community if they do not have a communal mikvah. The third category, chukkim, are supra-rational principles; they are Divine decrees about which the human mind can form no judgment. Chukkim completely defy human intellect and understanding. From time immemorial they have been a source of amusement, a target of scorn, and an uncomfortable and shameful presence to the detractors of Jewish observance. For the observant Jew, they personify a mitzvah at its best; a pure, unadulterated avenue of connection with G‑d. These mitzvot are recognized as the greatest, the ones capable of affecting the soul on the deepest level. Unimpeded by the limitations of the human mind, these statutes are practiced for one reason only: the fulfillment of G‑d's word. Examples are the laws of Kashrut, the prohibition against wearing shatnez (clothes containing a combination of wool and linen), and the laws of ritual purity and mikvah. When all is said and done, an understanding of the ultimate reason for the framework of Family Purity and its culminating point — immersion in the mikvah -- is impossible. We observe simply because G‑d so ordained it. Still there are insights that can help add dimension and meaning to our mikvah experience. The mikvah personifies both the womb and the grave; the portals to life and afterlife. In both, the person is stripped of all power and prowess. In both there is a mode of total reliance, complete abdication of control. Immersion in the mikvah can be understood as a symbolic act of self-abnegation, the conscious suspension of the self as an autonomous force. In so doing, the immersing Jew signals a desire to achieve oneness with the source of all life, to return to a primeval unity with G‑d. Immersion indicates the abandonment of one form of existence to embrace one infinitely higher. In keeping with this theme, immersion in the mikvah is described not only in terms of purification, revitalization, and rejuvenation but also — and perhaps primarily — as rebirth. The presence of potential life within fills a woman's body with holiness and purity. With the departure of this potential, impurity sets in, conferring upon the woman a state of impurity or, more specifically, niddut. Impurity is neither evil nor dangerous and it is not The concept of purity and impurity as mandated by the Torah and applied within Jewish life is unique; it has no parallel or equivalent in this postmodern age something tangible. Impurity is a spiritual state of being, the absence of purity, much as darkness is the absence of light. Only immersion in the mikvah, following the requisite preparation, has the power to change the status of the woman. Human beings share a nearly universal intuitive tendency for the forbidden. Solomon, the wisest of all men, spoke of "stolen waters which are sweeter." How many otherwise intelligent, calculated individuals have jeopardized their marriages and families in pursuit of the illicit because of its seeming promise of the romantic and the new? Mikvah introduces a novel scenario: one's spouse — one's partner in life, day after day, for better and for worse — becomes temporarily inaccessible, forbidden, off limits. Often this gives couples reason and opportunity to consider each other anew. In this "removed" span of time, from this new vantage point, they view and approach each other with enhanced appreciation. The benefits brought to married life by the practice of Family Purity have been recognized by numerous experts, Jew and gentile alike. To be sure, this type of analysis, as any other, is subject to argument and critique. Ultimately, however, mikvah's powerful hold on the Jewish people — its promise of hope and redemption — is rooted in the Torah and flows from a belief in G‑d and His perfect wisdom. Abramov, Tehilla. The Secret of Jewish Femininity. New York: Targum/Feldheim, 1988. A practical and detailed guide to the observance of Taharat Hamishpachah/Family Purity. Bulka, Reuven P. Jewish Marriage: A Halakhic Ethic. Hoboken, NJ: Ktav Publishing House, 1986. Friedman, Manis. Doesn't Anyone Blush Anymore: Reclaiming Intimacy, Modesty and Sexuality. San Fransisco: HarperSan Fransisco, 1990. Kahana, Kalman. Daughter of Israel. Trans. Rabbi L. Oschry. Jerusalem; Feldheim, 1970. A practical and detailed guide to the observance of Taharat Hamishpachah/Family Purity. Kaplan, Aryeh. Made in Heaven: A Jewish Wedding Guide. New York/Jerusalem: Moznaim Publishing, 1983. Kaplan, Aryeh. Waters of Eden: The Mystery of the Mikvah. New York: NCSY/Union of Orthodox Jewish Congregations of America, 1976. Kaufman, Michael. Love, Marriage, and Family in Jewish Law and Tradition. Northvale, NJ: Jason Aronson, 1992. Kitov, A. Eliyahu. The Jew and His Home. New York: Shengold, 1963. Lamm, Maurice. The Jewish Way in Love and Marriage. Middle Village, NY; Jonathan David Publishers, 1980. Lamm, Norman. A Hedge ofRoses: Jewish Insights into Marriage and Married Life. New York: Philipp Feldheim, 1966. The Modem Jewish Woman: A Unique Perspective. New York: Lubavitch Educational Foundation for Jewish Marriage Enrichment, 1981. Tendler, Moshe David. Pardes Rimonim: A Marriage Manual for the Jewish Family. Hoboken, NJ: Ktav Publishing House, 1988. Slonim, Rivkah. Total Immersion: A Mikvah Anthology. Northvale, NJ: Jason Aronson, 1996. Enhancing Intimacy. Taharas Hamishpochah: A Channel to Enrich Sensitivity, Love and Communication. Audio. Six talks (three cassettes) by Malka Touger. Available through Lubavitch Educational Foundation for Jewish Marriage Enrichment, 824 Eastern Parkway, Brooklyn, NY 11213. (718) 756-5720 or 778-1070. Fax: 735-4455. The Sanctity of Jewish Marriage: Insights into the Mitzvah of Taharat Hamishpacha. Video, 48 minutes. Available through Mikveh Israel of Montreal, 7015 Kildare Rd., Montreal, Quebec H4W 1C1. (514) 487-5581. Still Waters Run Deep. Video, 34 minutes. Available from Higher Authorities Productions, 9500 Collins Ave., Bal Harbour, FL 33154. (305) 867-1414 or 1(800) TORAH-18. Rivkah Slonim is co-director of the Chabad House at Binghamton University and author of Total Immersion: A Mikvah Anthology, (2nd edition, Urim Publications, 2006). She lectures nationally on family and women's issues. About the artist: Lital Itzhaky was born and lives in Jerusalem where she studied illustration and animation and has illustrated mainly children’s works, employing a diverse array of styles and techniques. She has taught both Art and Torah in Israel as well as America.